A recent arrival here at New Avalon is a sweet red dun quarter horse mare, Dixie, here for a month-long refresher course and tune-up. For the first week we do nothing but ground work together, in preparation for later work under saddle. With Dixie’s help I'll show you how to put together a good groundwork workout. Each training session lasts for about an hour and includes both sensitizing and desensitizing exercises. 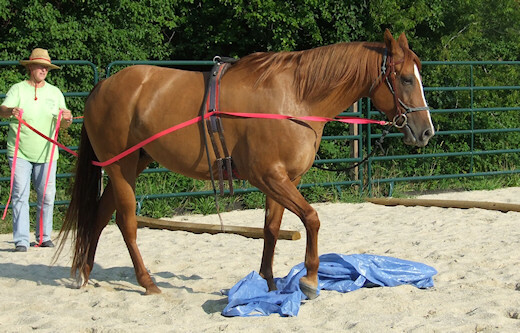 Each day we work on the head down cue, lateral flexion, disengaging the hindquarters (turn on the fore), turn on the hind, backing up, longeing with frequent changes of direction, and sending. 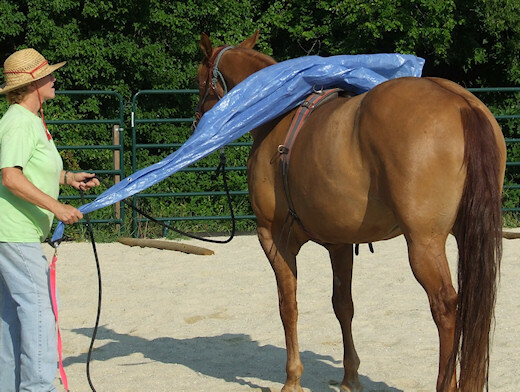 We also work on desensitizing with the lead rope, the stick and string, a towel, plastic tarp, beach balls, and flags, but not every one of these every day. While longeing or sending I frequently work her over obstacles on the ground. Giving her someplace to go and something to do helps Dixie to use the thinking side of her brain, and that has a very calming effect on any horse. 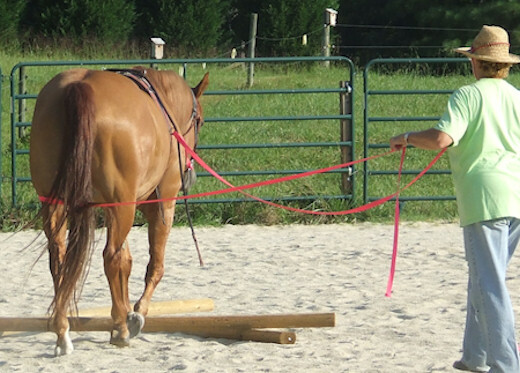 I always weight a session toward the exercises that a horse needs the most work on. 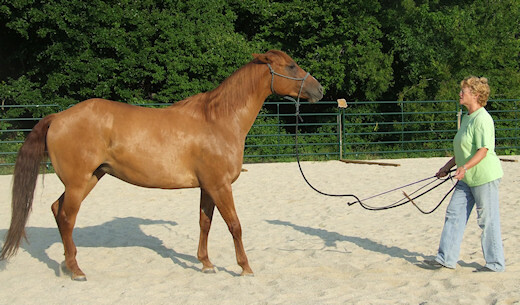 Since Dixie longes and backs beautifully, but is quite stiff and has a hard time reaching up under herself to disengage her hind end, we spend much more time flexing and bending than we do longeing and backing. Her stable mate, Doc, on the other hand, flexes and disengages with the lightest touch, but needs more work on his back-up. 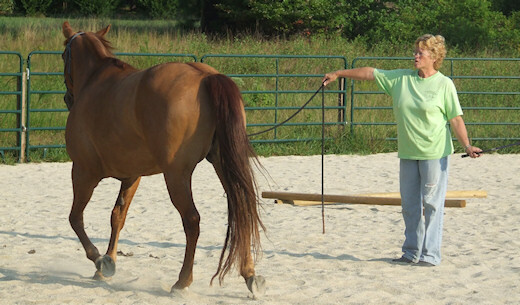 Every horse is different, and as you go through these exercises each will let you know where they need the most work. Fig. 1: Head Down 1. Dixie is heavily muscled and rather stiff, so we've spent quite a bit of time working on bending and suppling exercises. She's a tall horse and tends to hold her head very high, especially when she's anxious. 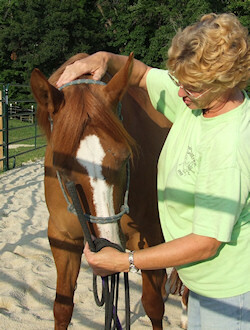 The head down cue will not only help her stay calm and relaxed, but it brings her head into easy reach for grooming, haltering and bridling. Here I'm applying steady pressure at her poll with the thumb and first finger of my right hand while, with my left hand cupped gently over her nose, I'm slowly rocking her head back and forth. As soon as she drops her head even a little, I'll release all pressure. Fig. 2: Head Down 2. Dixie has dropped her head and softened her neck. I have released the pressure on her poll and am rubbing her between the ears. Note how soft and relaxed her eyes and ears are. Fig. 4: Lateral flexion. Now that her neck is loosened up, she can give laterally much more easily. Just before this picture was taken she was leaning heavily on the halter, and I was just waiting her out. This picture captures the moment when she finally is giving to the pressure and is taking the tension off of the lead line. I will immediately release the line and give her back her head. Fig. 5: Back Up. Dixie isn't happy about it, but she is backing away nicely. This is one of the best exercises you can do to establish yourself as the boss in your 'herd of two'. As soon as I took the pressure off, Dixie's ears came forward and she licked her lips, both signs of relaxed submission. Fig. 6: Longeing. Here I'm giving Dixie clear direction with my right arm, and she has moved off to circle me in that direction. My stick really isn't needed now. Note the gentle bend in Dixie's body. 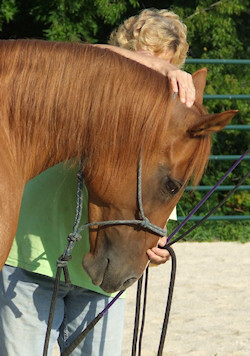 When longeing, you want the horse to bend on the circle with her head tipped into the center, never to the outside. Fig. 7: Stop longeing, and yield the hindquarters. 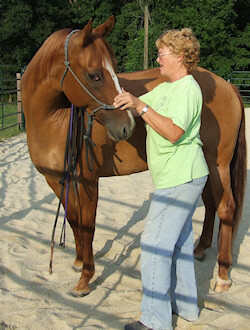 I’ve brought the hand with the lead rope in toward my belly and stepped toward her hind end. Bending over and staring at her tail, I have swung the stick toward it and Dixie has started to swing her hind end away from me. She will end up facing me at the end of her line, waiting for the next cue. Fig. 8: Head Down Again. I go back to those exercises that Dixie needs the most practice in. Between active exercises I work on the static ones. 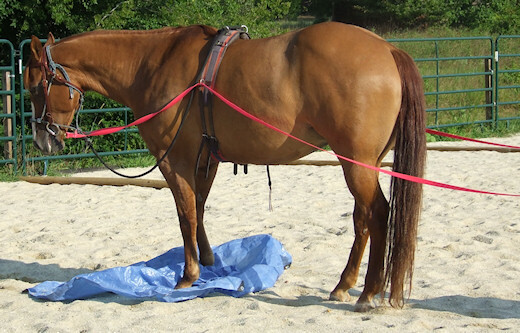 This allows the horse to rest and catch her breath if she needs to. 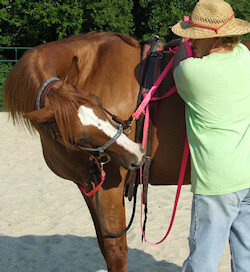 The Head Down and Lateral Flexion exercises also have a great calming effect. Fig. 9: Desensitizing. Here Dixie is standing quietly as I repeatedly hit the ground next to her with my stick and string. She's standing still, but she is tense: her head is up, her lips are tight, and her eyes are hard. Soon after this picture was taken, she dropped her head and licked her lips, and I stopped and rubbed her face with the end of the stick. Note my body language: I am not confronting her — my mid-line and my eyes are turned away from her and my body is relaxed. I’m not asking her to move. If she tried to leave I would simply keep her head tipped toward me and move with her, continuing to smack the ground next to her, until she stopped and relaxed. Fig. 10: More desensitizing. Now I'm swinging the string of my training stick in circles over Dixie's head. While she's certainly not taking a nap, nonetheless she is standing still and quiet. A few seconds after this picture was taken she yawned and dropped her head. 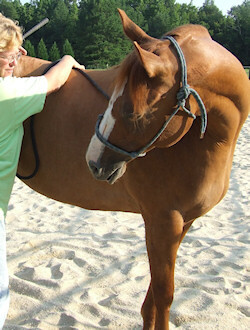 It is important to continue with the exercise until the horse holds still and shows such signs of relaxing. Fig. 11: Ground driving. 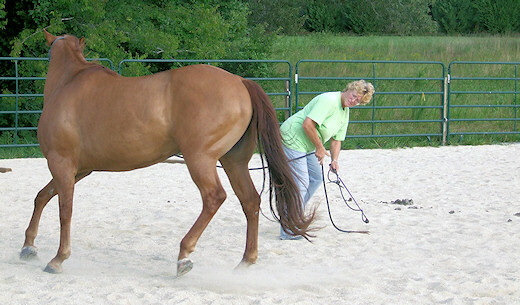 A wonderful exercise, ground driving enables you to learn how the horse responds to the bit and to fix problems before you get into the saddle. Dixie's head is high, but I'm not worried about that at this point. Her head will come down as we go through these exercises and she relaxes more and more. Be sure to use lines long enough to allow you to stay out of the kick zone. Fig. 12: Ground driving over obstacles. 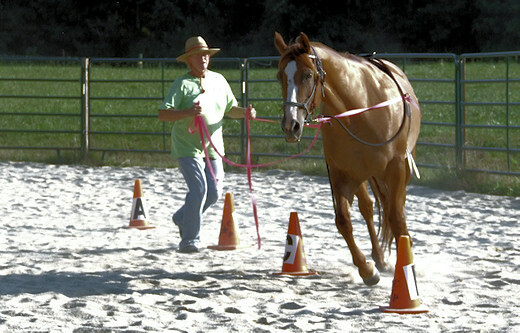 Ground driving is a great way to introduce your horse to obstacles. Dixie needs to slow down and think in order to cross these timbers. Note how low her head is now. Fig. 13: More obstacles (and surprises). If Dixie doesn't kick this beach ball along in front of her I will kick it as I pass, making it jump beside her or maybe even bounce gently off of her rump. I would not do this if I hadn't already introduced the beach balls earlier in the ground work; by now I know that she is not afraid of them. Fig. 14: The serpentine. A few traffic cones set in a line make a great serpentine course. We have walked it several times already, and now we're taking it at the trot. 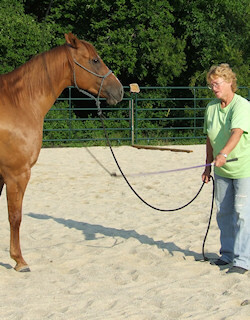 Dixie is bending nicely and responding to very light contact on the reins. Fig. 15: Tarp tricks 1. 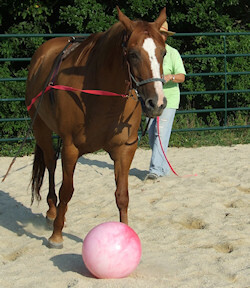 Dixie is very relaxed here and working on a loose rein. Her ears are back, listening to me, and her eye is soft and calm. Plastic tarps are great obstacles. They move and make noise. They flap in the breeze. Ask your horse to walk and trot over them. Hang them on the fence and work past them. Pick them up and rub them all over your horse. Fig. 16: Tarp tricks 2. A short nap on the tarp! Fig. 17: Give to the bit. Before and after our ground driving we work on giving to the bit. 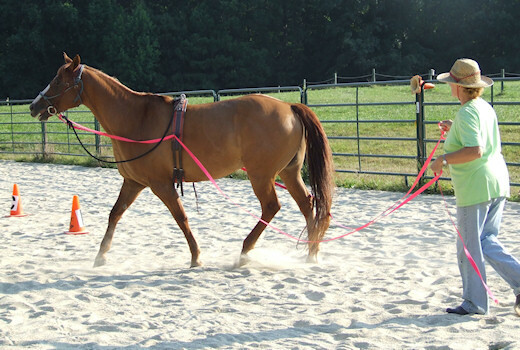 We've been working on lateral flexion in the halter all week, and now I get to see how she will respond with the bit. 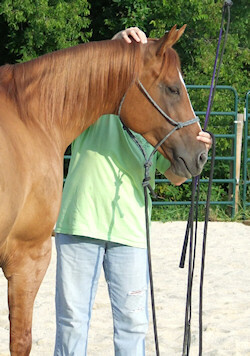 In this picture she is leaning on the bit just as she does in the halter. I simply hold her about three quarters of the way around and wait for her to give the last few inches, taking the tension off of the rein. Fig. 18: Drags 1. The long lines are off the bit now, and I have hooked one of them to the tarp. Note that the line is just caught on the top ring of the surcingle, not passed through or tied to the ring; I want to be able to get rid of the drag fast if we get into a wreck. We begin with the drag a good distance from her to allow her get used to it moving along behind us. Fig. 19: Drags 2. I’ve pulled the drag closer, and now I'm asking her to turn into it. This pulls the line around her rump and over her hocks. You can see she is not quite sure about this. Keep your eye on how your horse is reacting to this at all times. You want to be ready if she jumps. Fig. 20: Tarp sack-out. 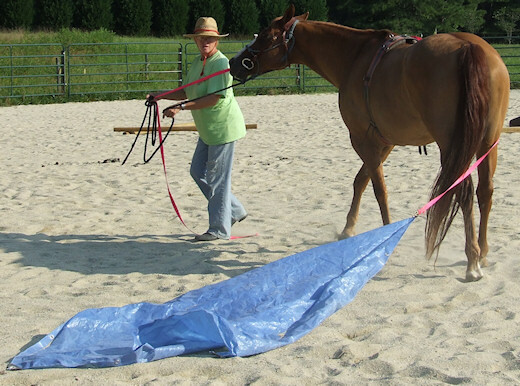 I end this dragging session by pulling the tarp up and over Dixie. We've worked with it all week, walking and trotting over it and rubbing it all over her body, so she is now quite unconcerned as it slides across the ground and climbs up and over her back. The more things you desensitize your horse to on the ground, the calmer she will be once you are in the saddle, so do your homework.